I couldn’t think of a better way to celebrate the Greek tradition ‘good living’ than with a recipe to make for your loved ones on Christmas morning. The magic of Christmas, being with close loved ones and the overall joy and good cheer Christmas and Christmas memories bring, is the essence of ‘good living’ and happiness! Traditionally, Christmas is the second most important holiday of the year in Greece; Easter coming first. Common Greek Christmas traditions do not include a Christmas tree (however, in recent years Christmas trees are becoming more popular), but a shallow wooden bowl with a piece of wire suspended across the rim; from that hangs a sprig of basil wrapped around a wooden cross. Greek Christmas tradition states that family members dip the cross and basil into some holy water and uses it to sprinkle water in each room of the house. This ritual is believed to keep the Killantzaroi away from the house. The Killantzaroi are believed to appear during the 12 day period from Christmas to Epiphany (January 6) and cause mischief such as make milk sour and extinguish fires. Another tradition in Greece is Christmas Eve where village children travel from house to house offering good wishes and singing ‘kalanda’, the equivalent of Christmas carols. As with many cultures, the Christmas day feast is the main attraction. A common Christmas day dinner includes such foods as lamb, pork, baklava and ‘christopsomo’ (‘Christ bread’); which is sweet bread formed into various shapes. Today’s Christmas recipe is a traditional Greek recipe (and the last of my three recipes for the Greek “good living” series*). 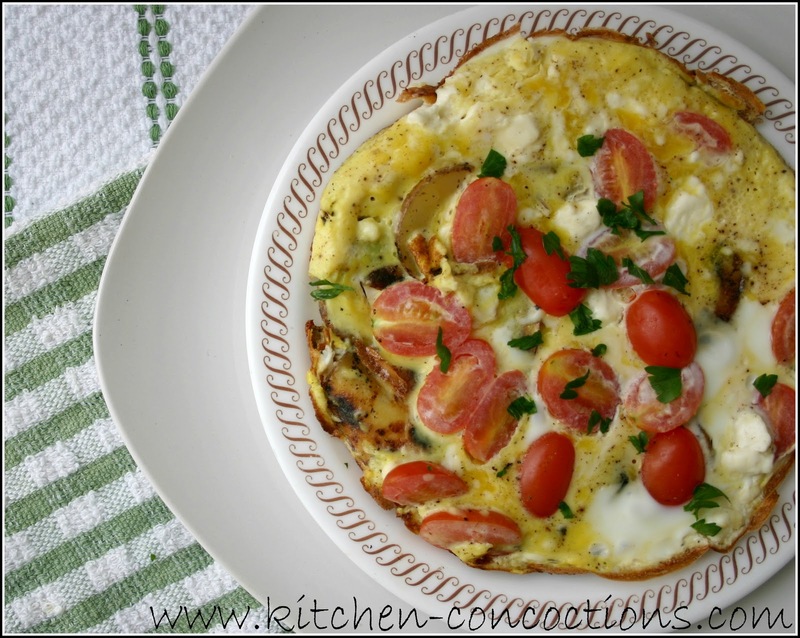 This recipe for a basic potato “pie-like” omelet is very versatile. I used grape tomatoes and feta cheese to add flavor, but capers, olives, or spinach would also add a nice touch. Serve this with a green salad for a beautiful complete meal perfect for Christmas brunch! In a 4 or 5-inch nonstick frying pan, melt butter and layer potatoes slices in the pan in overlapping circles, to form one large potato ‘cake’. Season potatoes with salt and pepper. Cover and cook for 4 minutes. In a small bowl whisk together eggs and milk. Stir in tomatoes and feta cheese. Pour egg mixture over partially cooked potatoes. 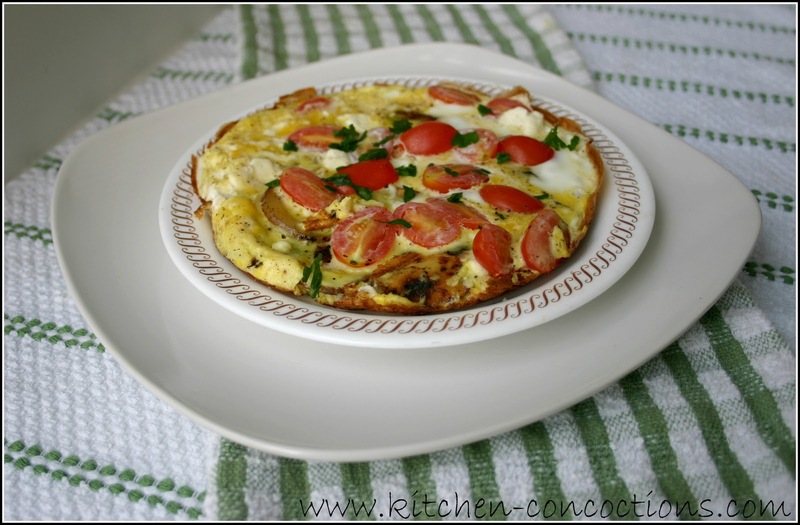 Cover and cook for 5-6 minutes or until eggs are cooked through. Note: This recipe can easily be doubled or tripled to feed more people, just cook in a larger pan.